The Jovian Moons Campaign was a conflict that took place on the moons of Jupiter between the United Nations and the Frieden movement, from March to June 2160. The campaign would become one of the deadliest conflicts to ever take place within the Sol system and served to only escalate tensions between governments and factions, foreshadowing the impending Interplanetary War. In 2158, the Frieden movement was established in Katreus, a major city on Europa. Largely backed by a group of corporate interests of the Unified German Republic, the Friedens sought independence from the administration of the United Nations. The movement quickly escalated towards violence when the Friedens leveled an embassy in Thynia with military-grade explosives. In response, the United Nations labeled the Friedens terrorists and deployed colonial advisors to the nearby Io to help organize policing efforts. In the years that followed, few colonists remained neutral as both the Friedens and Koslovics spread their influence among humanity's interplanetary colonies, with the United Nations lacking the military capability to prevent such actions. In an open act of rebellion against the United Nations, the Friedens attacked the colonial advisors on Io in 2160. The attack on the colonial advisors led to three months of fighting between the Koslovic and Frieden forces from March to June 2160, sparking the Jovian Moons Campaign. The campaign would be fought among Jupiter's moons. The United Nations attempted to pacify the situation, but with no success. To strengthen their efforts, the United Nations called upon national governments of Earth to utilize their own militaries and aid in the campaign. The distributed nature of their forces led to disorder amongst the ranks of the Earth militaries. The death toll among all sides was substantial. The Jovian Moons Campaign was one of the bloodiest conflicts that has ever taken place within the Sol system. The conflict served to strengthen the anti-government and anti-corporate sentiment growing among colonists. 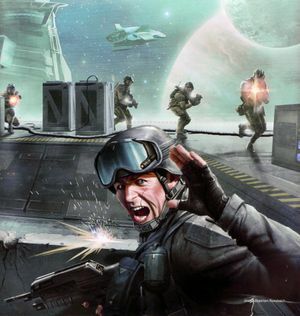 The campaign led to mass militarization among Earth's nations—many of which sponsored colonies within the system—as they began fighting proxy wars off-planet. With the campaign's end, conflict within the Sol system ceased for several months, with some speculating that the worst had passed. However, a series of bombings in February 2162 would spark the Rainforest Wars, a nineteen-month conflict that spread across South America and reignited violence throughout the Sol system. The Jovian Moons Campaign would be remembered as the conflict that would foreshadow the impending Interplanetary War. At some point prior to the Fall of Reach in the summer of 2552, several Spartan-IIs participated in an operation on Europa, which would be the liveliest incursion to occur on the moon since the Jovian Moons Campaign.